Henry Nguyen‘s progress to identify the genes responsible for root-knot nematode is garnering some attention. The Bond LSC and CAFNR plant scientist helps find genetic candidates for the disease, as explained in this recent CAFNR story by Randy Mertens. A team of scientists from the University of Missouri, the University of Georgia and the Beijing Genome Institute have used next-generation sequencing to identify two genes — out of approximately 50,000 possibilities — that defend soybeans from damage caused by the root-knot nematode (RKN) parasite. This parasite causes millions of dollars in yield losses each year in the United States. This is the first time the process has been used in soybean research. Using another genetic technique, the team is now working to identify the specific gene that prevents RKN from infecting the soybean. With this knowledge, resistant soybean varieties or cultivars can be bred for farmers. RKN-infected roots are stunted and darker in color than healthy roots and have fewer nitrogen-fixing nodules. Attached SCN females may be visible as shiny white or yellow spherical bodies on the roots. Courtesy Fisher Delta Research Center, Missouri Agricultural Experiment Station. Researchers believe that this process also can be applied to other crops to map genes important for traits, such as yield and stress responses, said Henry Nguyen, director of the National Center for Soybean Biotechnology (NCSB), housed at the MU College of Agriculture, Food and Natural Resources. The discovery was recently published in theProceedings of the National Academy of Sciences. The research was funded by the Missouri Soybean Merchandising Council. The root-knot nematode is a microscopic roundworm that can become a parasite on an enormous variety of crop species including the soybean, potato, sugar beet, rice, coconut palm, banana, pepper, tobacco, watermelon, tomato and peanut. It is one of the three most economically damaging plant parasites worldwide, causing an average worldwide yield loss of 5 percent, Nguyen said. J. Grover Shannon, associate director of the NCSB and David M. Haggard Endowed Chair of Soybean Breeding at MU, estimates that RKN and other nematodes (excluding soybean cyst nematode) accounts for annual losses of more than $50 million in soybean yield in the United States. The U.S. is the world’s largest producer of soybeans, growing more than 3 billion bushels, or 33 percent of the world’s production. The value of the 2011 U.S. soybean crop exceeded $35.7 billion. U.S. soybean and soy product exports exceeded $21.5 billion in 2011. Jinrong Wan, MU research scientist, said RKN larvae infect plant roots, causing the formation of root-knot galls that drain the plant’s photosynthate and other nutrients. Infection of young plants may be lethal, while infection of mature plants causes decreased yield. RKN is a silent killer of profits, Wan continued. Often, it thrives as a parasite throughout a growing season in annuals, or over many years in perennial crops, without any above-ground signs or symptoms. Only when harvest is over and yield has been quantified is the parasite’s damage commonly seen. No method currently used effectively controls RKN. Crop rotation is a typical technique, but with incomplete results because RKN can live for a long time and can infect an enormous variety of plants. Nematicides are another intervention, but are dangerous to the respiratory systems of animals. Biological control is practiced in some cropping systems, with two organisms showing only limited success. Clearly the most efficient method of control is by using resistant cultivars, said Nguyen. Nguyen said next-generation sequencing technology is a new and important tool for plant scientists. Currently, scientists use single nucleotide polymorphisms to map genetic markers to determine what genes are responsible for important traits, such as disease resistance. That process, said Nguyen, is too slow considering the tens of thousands of genes that have to be surveyed. To speed up the process, Nguyen’s team used Next-Generation Sequencing Technology to sequence the whole genome of more than 200 soybean inbred lines. Another advantage of using this method is that the mapping resolution can be significantly improved – the genes can be narrowed down to a very small chromosome region quickly, Tri Vuong, MU research scientist, added. This story was originally posted on CAFNR News where you can find on MU agriculture research. 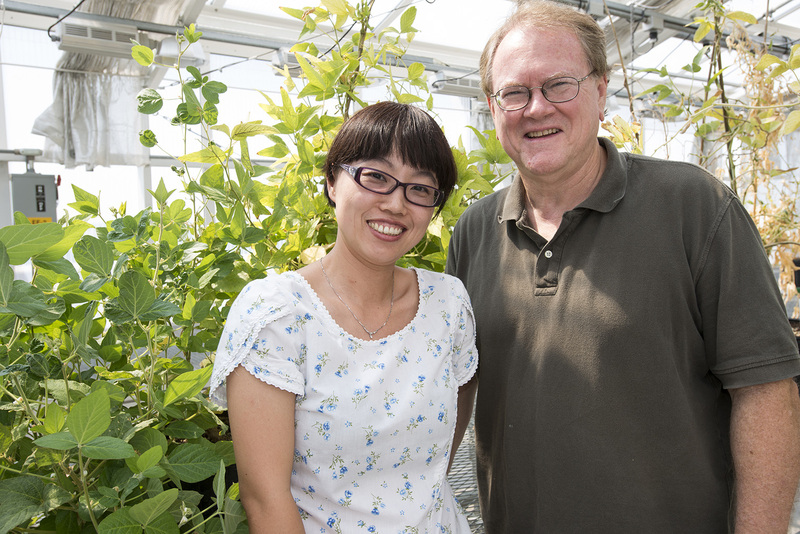 Yan Liang and Gary Stacey research the symbiosis between legumes, like these soybeans, and nitrogen-fixing bacteria at the Bond Life Sciences Center. A silent partnership exists deep in the roots of legumes. In small, bump-like nodules on roots in crops like soybeans and alfalfa, rhizobia bacteria thrive, receiving food from these plants and, in turn, producing the nitrogen that most plants need to grow green and healthy. Scientists have wondered for years exactly how this mutually beneficial relationship works. Understanding it could be the first step toward engineering other crops to use less nitrogen, benefitting both the bottom line and the environment. University of Missouri Bond Life Sciences Center researchers recently identified what keeps crops like corn and tomatoes from the sort of symbiotic relationship enjoyed by legumes. Science published this discovery online Thursday, September 5, 2013. “Our work uniquely shows that all flowering plants, not just legumes, actually do recognize the chemical signal given off by rhizobia bacteria,” said Gary Stacey, Bond LSC investigator and plant sciences professor. His lab identified the most likely receptor for this chemical and showed that the signal suppresses the plant immune response, which normally protects plants from pathogens. This allows rhizobia a better chance to infect and live inside the plant. Chemical signals are extremely important to plants. Since plants can’t walk around to explore or avoid danger, receptors in cells of each plant act as its eyes and ears. They gather information about insects, bacteria and other threats and stresses from chemicals. These signals allow the plant to respond and adapt to its environment, such as resisting stresses like drought and infection by pathogens. With rhizobia, the bacteria produce lipo-chitin, a sugar polymer with a fatty acid attached. This molecule is similar to chitin normally found in the cell walls of fungi, the exoskeletons of crustacea or insects. Legumes, such as soybean, sense this signal – called a NOD factor since it triggers nodulation – and create the nodules where the bacteria fix atmospheric nitrogen into the soil. That doesn’t happen in other plants. Scientists once gravitated toward thinking that non-legumes, which are not infected by rhizobia, just weren’t capable of receiving the NOD factor signal. But, a less popular theory guessed that plants like corn do receive the NOD factor signal but interpret it differently or have a problem with the mechanistic pathway. Stacey said figuring out which is happening is like fixing a motion-detecting light. Stacey’s lab set out to determine which was true. Corn, soybean, tomato and Arabidopsis were treated with bacterial flagellin, a protein known to cause a strong immune response, and also received doses of the NOD factor. These represent a diverse spectrum of plants to ensure the results were wide ranging. Results showed the NOD factor suppressed the immune response by 60 percent. Since all plants seem to respond to the NOD factor, scientists think this immunity suppression ability could be evolutionarily ancient and part of how rhizobia bacteria changed from foe to a symbiotic partner. Nitrogen has both an environmental impact and high price tag. Fossil fuels are combined with nitrogen from the atmosphere to create the fertilizer. When applied to fields, the excess fertilizer also ends up in rivers and streams, contributing to nitrification and hypoxia in waterways. “The dead zone in the Gulf of Mexico is generally attributed to agricultural runoff and producing nitrogen fertilizer increases dependence on fossil fuels,” Stacey said. U.S. farms used almost 13 million tons in 2011, according to the USDA, with almost half of it being applied to corn. Nitrogen prices ranged from $400-$850 per ton in the U.S. in 2013. Nitrogen fixed in the soil by rhizobia is the closest thing to a free lunch a plant can get. For farmers, that’s one less input needed and is part of why legumes remain a staple of crop rotations. In 2012, the Bill & Melinda Gates Foundation donated $10 million to the John Innes Center in Norwich, United Kingdom, to study and develop symbiotic relationships between bacteria and cereal crops, most notably corn. It hopes to bolster subsistence farming in Africa through the five-year project. While it’s a long way off, Stacey’s research is another step to improving crops. A grant from the Office of Basic Energy Sciences of the U.S. Department of Energy funded this research. Gary Stacey is a Bond Life Sciences Center investigator, a professor of plant science in the University of Missouri College of Agriculture, Food and Natural Resources and has an adjunct appointment in MU’s biochemistry department.